This topic contains 0 replies, has 1 voice, and was last updated by aacable 8 months, 1 week ago. 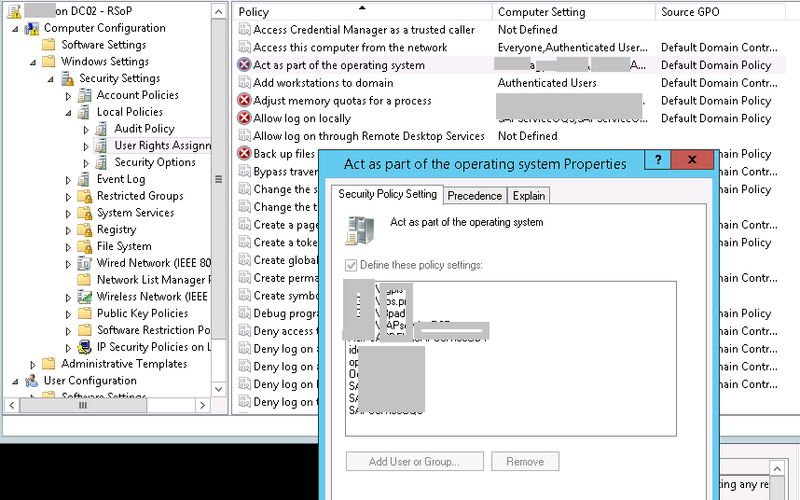 Event 2012 SECLI Security policies were propagated with warning. 0x534 : No mapping between account names and security IDs was done. Cannot find [email protected]. Cannot find admin. Cannot find dbServiceOQS. Cannot find daaadm. Cannot find Local Administrators. Cannot find opradm. Cannot find Oqsadm. Cannot find dbServiceDAA. Cannot find dbServiceODV. Cannot find dbServiceOPR. Cannot find XXXdbdevdbServiceDAA. Cannot find XXXdbdevdbServiceODV. Cannot find semwebsrv. Cannot find semsrv. Cannot find semapisrv. Cannot find dbServiceR3Q. Cannot find dbServiceR3D. Cannot find S-1-5-80-948765316-811284391-187558744-2005173589-387111393. Cannot find S-1-5-80-3958276243-2739099675-334681800-2039304502-2384811254. Cannot find S-1-5-80-3784820641-2391269600-1434288029-1177689286-1786581930. Cannot find S-1-5-80-1625573271-3360770164-1808504902-59951099-39959922. Cannot find [email protected]. all of above accounts , some exists in DOMAIN, and some are local application servers specific accounts which are responsible to start stop various services like in SAP servers or perform other tasks in local application system. how can I settle this? If I remove these accounts then many services on various application servers will not work as they require rights in order to perform. Can I ignore these messages?